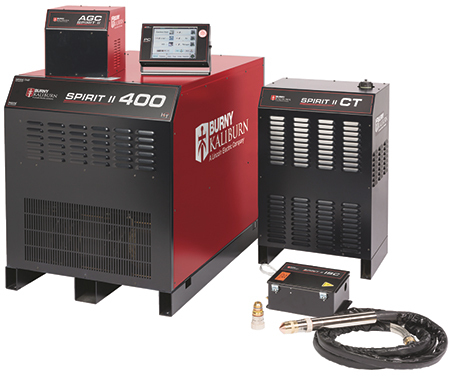 The new Spirit II Series plasma system from Burny Kaliburn, a Lincoln Electric company, features FineLine high-definition plasma-cutting technology that delivers excellent cut quality over the entire consumable life. It does so by achieving the least part taper over the life of an electrode. When paired with the firm’s UltraSharp Hole technology, the system also delivers optimal hole quality. This family of Spirit II plasma cutting and marking systems features three amperage options—a 150-A model that pierces most materials to 1 in. thick; a 275-A model to pierce to 1.25 in. thick; and a 400-A that pierces to 2 in. thick. All Spirit II models deliver precise, square, dross-free cuts with 2 deg. or less cut-edge bevel. Operating costs are minimized by using the same consumables to cut and mark. Additional features include Impulse Start Technology, to eliminate high-frequency starting; self-diagnostics that track pierces, pierce errors and types of errors for the last six electrodes; and extended shield-cap life through the use of very low transferred-arc current sensing for higher starting height.